estamos bien, estamos practicando algo de sus enzeñanzas aca en la iglesia y el pastor esta muy feliz. formamos el equipo de interseccion y iniciamos el domingo con cuatro hermanos. We are forming a team of intercessors and are beginning this Sunday with 4 brothers. I spoke on developing a team for your apostolic work — that of planting churches. Yet some of the principles are just as valid for ongoing church work — particularly having a team of personal intercessors for the pastor. I spoke of the value of our intercessors, and the value of a team praying for us personally and this elder took it to heart and back to his church. 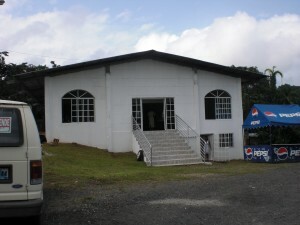 I’m hoping to preach in this church next time I am in his village — a date potentially scheduled in October of 2009. 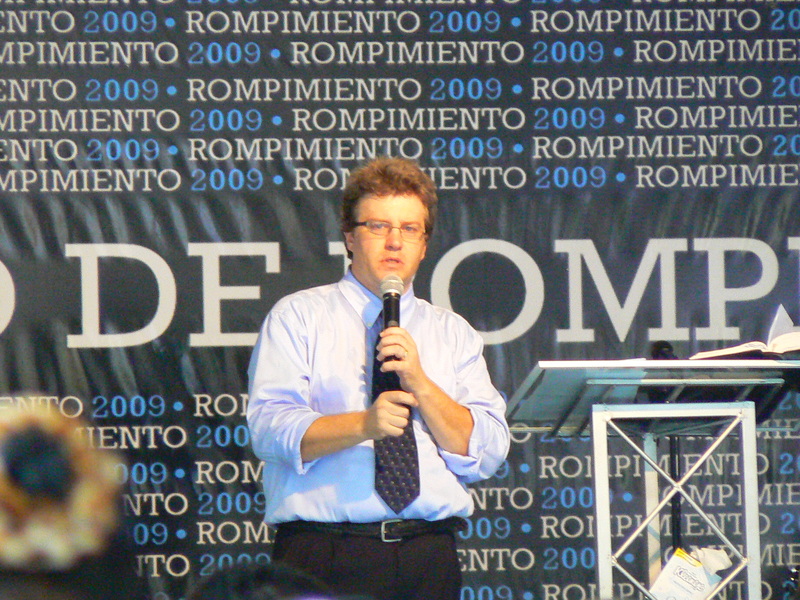 About 100-125 people gathered at Centro Cristiano Filadelfia, for Live 2009, a missions congress on evangelism, church planting and leadership. Pastor Walker, your teaching Saturday [on teamwork in church planting] really impacted me. There was a moment when the Holy Spirit came upon us and called us into a deep time of prayer — to call the church into cooperating with God’s spirit. That was a powerful moment for me, and I believe, for our church. Powerful. We’ve just launched a new church that is not 4 months old and already we are beginning to think about how we can get you back out here to help us nurture that church along. The host church has a particular vision to work with the marginalized and the poor. They dream of purchasing the land around them to setup halfway houses. While waiting on their dream, they have also planted another church that is drawing young people from some of the dangerous areas of the city. 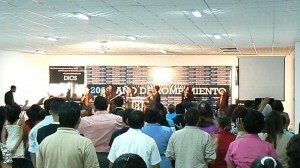 It is led by a young pastor in his early 20s, who served as our worship leader and conference organizer (pictured to the Right, one of the sons of the pastors). During that same teaching and call to prayer, we moved into a time of prayer for Panama, crying out to God for his favor and abundance. It was a kairos moment that snuck up on us. I was simply teaching and when wrapping up, we closed the time in prayer. It wasn’t just an ordinary ending prayer. The Holy Spirit called us forth to engage in deep prayer for the needs of the community, protection for the church plant, as well as a time for the nation. While the Lord did other work through the other presenters, it was this moment people reflected back to me as to what they remember of my teaching. This was a powerful moment. Those of you who know what it’s like to be called into intercession know the power of this calling and the intensity of this moment. 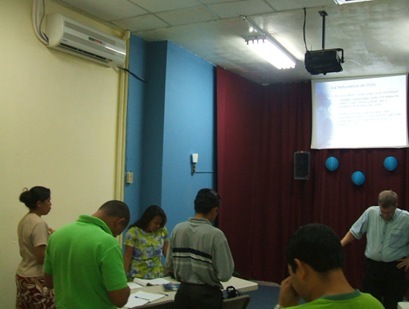 One elder, from a province about 6 hours away, received a vision in full color. He never had a vision before, so he pulled me aside to talk with me about it. It was awesome to help this Christian brother discern what God was saying in this vision. This same elder also felt called to join our intercessory team. Drunk men — men who spend their entire paycheck in a weekend to get wasted. 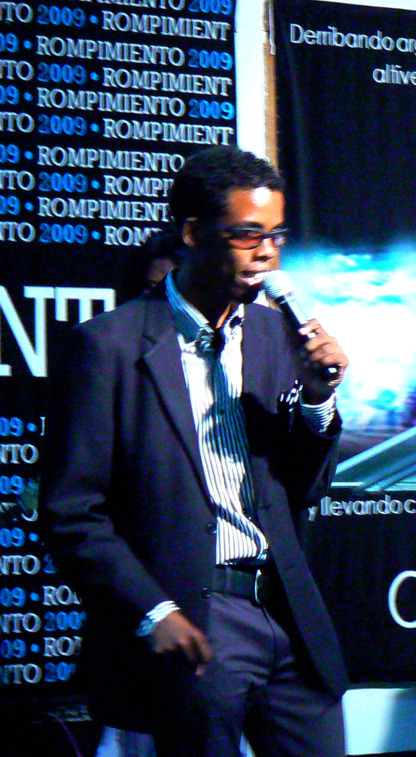 Overcoming a church scandal more than 12 years ago. In a community that small with a stable population, the church had a reputation that was harmed, and people remember. This church has wrestled with how to overcome that, by serving the neighborhood in pratical ways, praying, fasting. 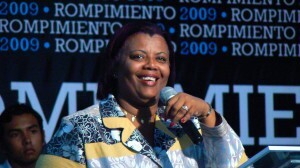 Led by Pastora Diana Maxwell (pictured) and her husband Lester. They gathered from several provinces (like states in the US) to spend the weekend receiving teaching on Missions and Evangelism. Having lived here for two years, I know and understand the sacrifice it takes for people to give up their weekends, spend money, and travel great distances by public transportation. The logistical challenge to overcome to get here reflects the demand for this information. When you want something, you do something. I was joined by Pastor Joshua Sándigo (Phoenix Arizona), Doctor Amilkar Kraudi (Nicaragua) and Lester and Diana Maxwell (Colon, Panama). B. A strategic team for the expansion of the Kingdom of God. We are grateful for you who help us do this work. We are unable to do it without your support. Though we do receive an offering from events like this, it still doesn’t cover all the expenses of getting there. That’s where we trust God to provide for our needs through His people. We need people to join our monthly team as well as one time gifts to meet our monthly budget or $3500 minimum, $5000 comfortable for next year. 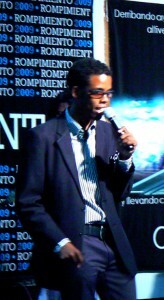 In August, I participated in a seminar about business as the means to generate revenue to support your ministry. A Honduran who distributes paint. All four of us spent a few hours talking about micro enterprise and how that can fund mission. 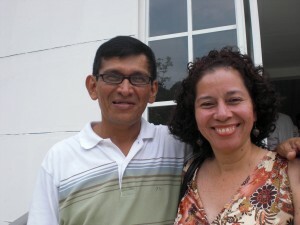 The Honduran gentleman is a pastor who is planting a church here in the city. His business generates enough revenue and is managed by employees that he is capable of having his financial needs met here in Panama. 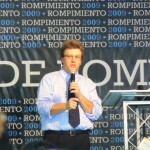 The accountant from Costa Rica has a professional practice that gives him enough time to freely give workshops on ministering to the physically disabled (a huge need in Latin america). 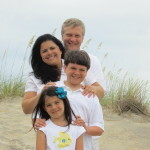 The business consultant has specialized knowledge in human resources that he’s able to work and still do ministry. I speak for a living and sell information on-line, which partly enables our work here. We are not yet self-supporting, but have several donors who give to us on a monthly basis to advance our work here. The US has a developed ministry partnership concept that uses support raising. This concept is not widely practiced or accepted here (from my limited point of view). This session was recorded and being distributed by DVD around the country to inspire potential missionaries to think how they might fund their own work by monetizing their skills and passions. I think more and more missionaries, particularly from developing nations like Panama, will need to think in terms of creating wealth through business, rather than relying on the shared resource system that has developed in the US. The idea of missionary support, as practiced in the United States, is just not a common practice and in some ways may me against the cultural grain. To fund the work of missions at this point in history needs another way, and thus we spent time thinking along these lines. What is your skill or trade? How can you use it to generate money? Ask yourself: “What specialized knowledge or skill that I have that people will gladly pay me for?” It could be a product, photos, information, arts, cooking skills, or even ideas. It is our hope that the DVD will inspire small business, that would generate funds for global missions.